I always have pieces of vintage fabric in my craft box, from large sections of collectable textiles, to small off cuts that are left over from my latest project. 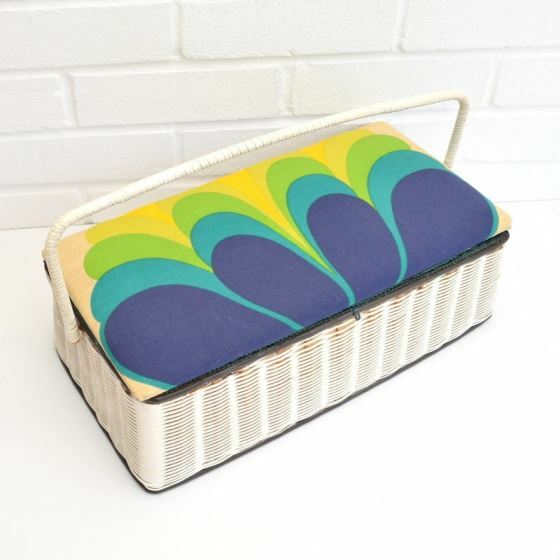 While out shopping at vintage fairs and festivals, I often see the most amazing designs from 1950s barkcloth covered in atomic patterns to more retro 1970s swirls in oranges and browns. 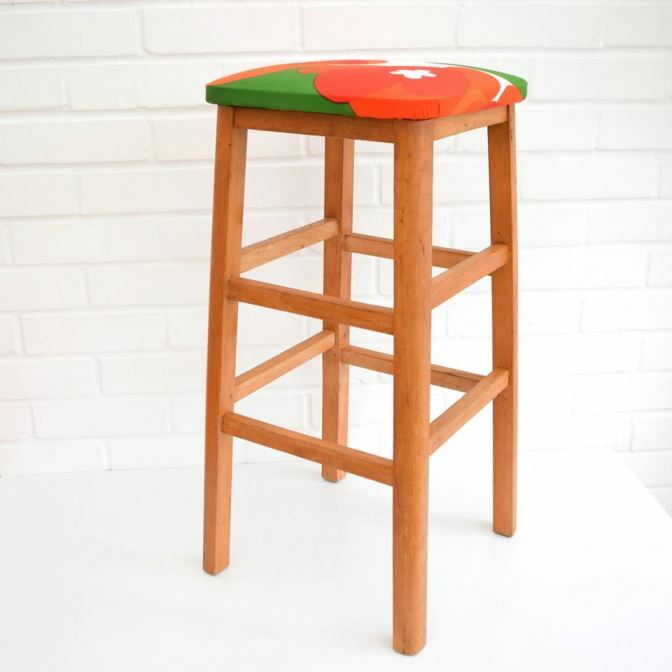 Both get me excited as they can brighten up any room or cover any old stool, bringing a sense of fun and delight to the space. 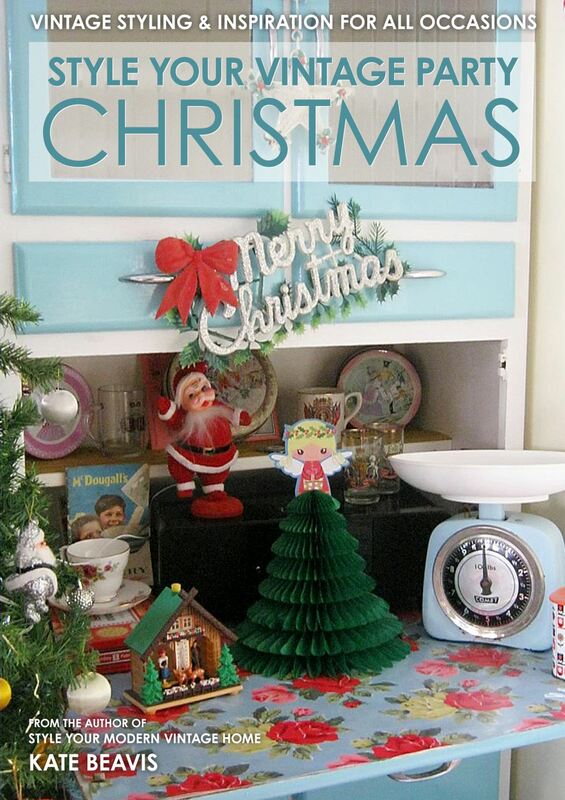 My favourite designs however stem from the 1950s. 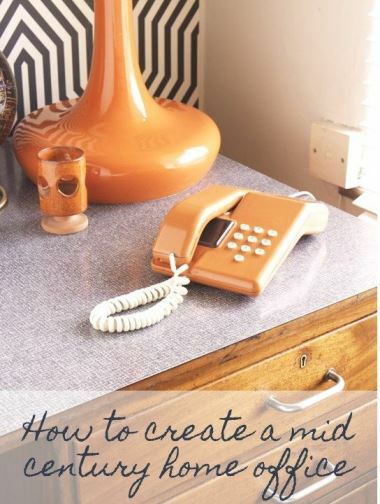 After 1951, houses celebrated contrasting designs and colours on the curtains, carpets and walls in reds, yellows and blues. These textiles were seen as modern with abstract shapes, strong repeat patterns and often almost blurry images especially on florals. These were on new fabrics such as spun rayon and barkcloth. Curtains were floor length and unfussy, sofa fabrics tended to be woven with a few coloured flecks in, walls if painted were bright picking out a hue that was in the curtains. 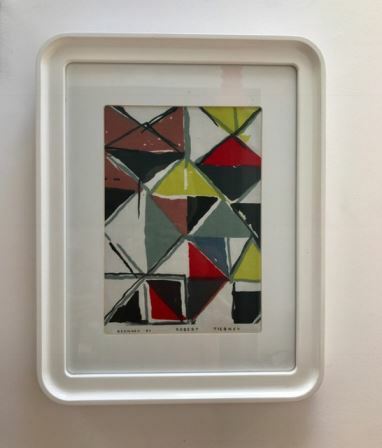 Leading textile designers exhibited their work at the Festival of Britain including Lucienne Day and David Whitehead. Day won awards for her designs which primarily drew on plant forms. Some say she was the first person since William Morris to produce repeat intricate and popular patterns inspired by nature, yet cleverly made them feel modern. In a time of re growth her designs not only represented growth but also took inspiration from abstract artists such as Miró and Klee. 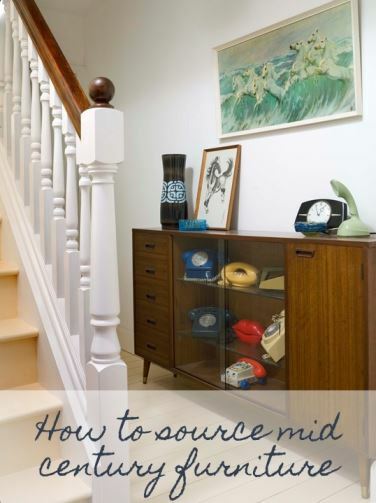 Her textiles were affordable, allowing everyone to embrace this new look while having their own piece of art within the living room.” – Style Your Modern Vintage Home. So what to do with all those pieces you find? Here are some of my favourite ideas. Frame off-cuts of fabric to create great pieces of art. Sew the fabric to a linen backing to ensure it hangs firmly in place. Attach double sided tape to the linen not the fabric and attach to the inside of the frame. This way the vintage fabric is not damaged. 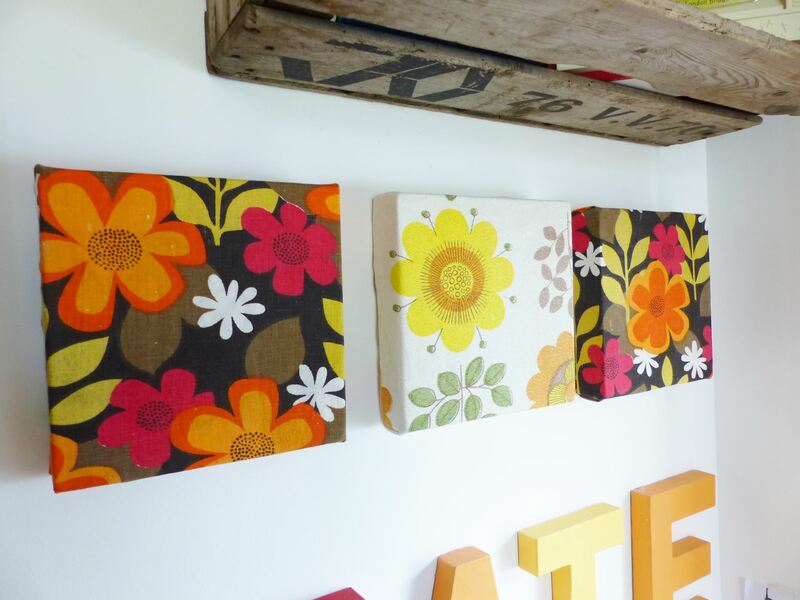 Buy or make a canvas (I like to buy these in charity shops) and cover in your chosen fabric. 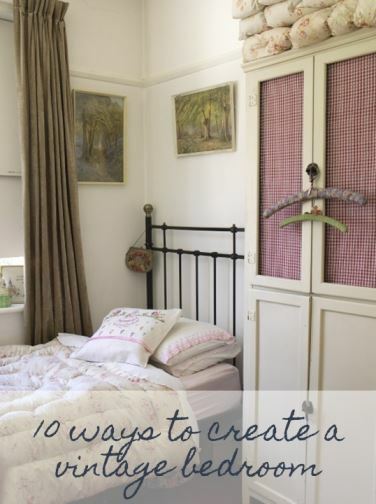 This works really well in a children’s room using cute old fashioned designs to give a sense of nostalgia to the space. Cover a stool with your favourite designs, especially if the stool is vintage but has a split in the vinyl top which is often the way. Pop out the original top and firmly spread the fabric over it, using a staple gun to fasten it into place underneath. 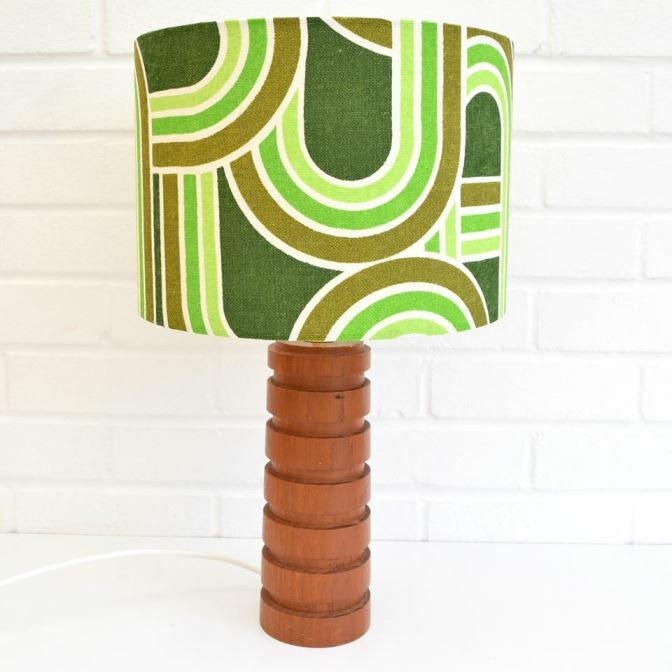 Making your own lampshades is such a great way to add funky designs onto something that is often so plain. Find out how here on this tutorial. Obviously you could cover anything with vintage fabric but I particularly like covering vintage sewing box lids when their fabric is all worn. Also these are often very pretty so a great way to brighten the look if pastel florals are not your thing. 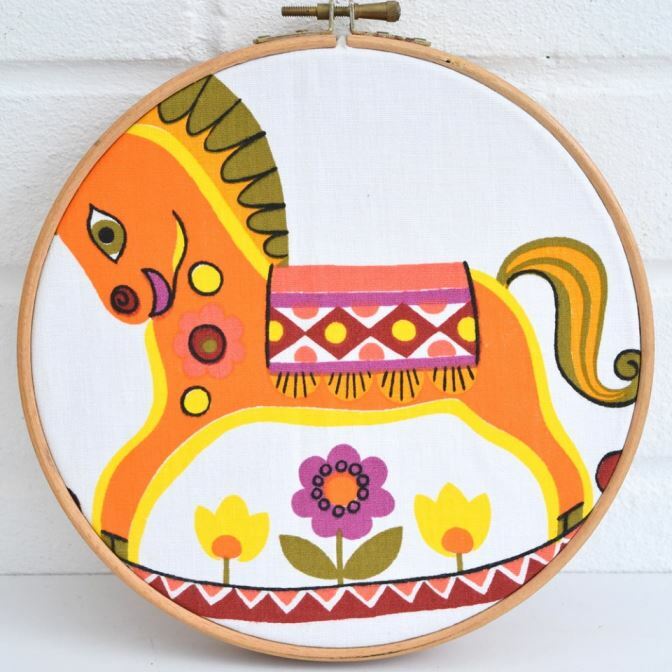 The perfect place for smaller pieces of vintage fabric is framed inside a wooden embroidery hoop which can be bought at craft shops or again in charity shops. They come in all sizes so you can show off even the smallest remnant. 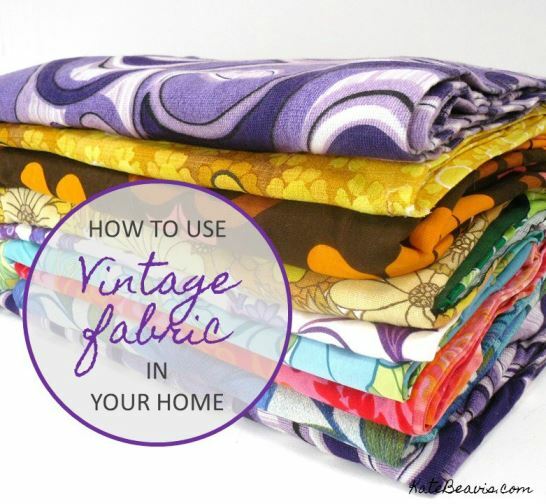 The best way to show off your stand out pieces of vintage fabric is by making cushions. Make the fabric go further by backing the cushion with plain material such as velvet. I love to mix and match modern cushions with handmade ones to create an eclectic look. 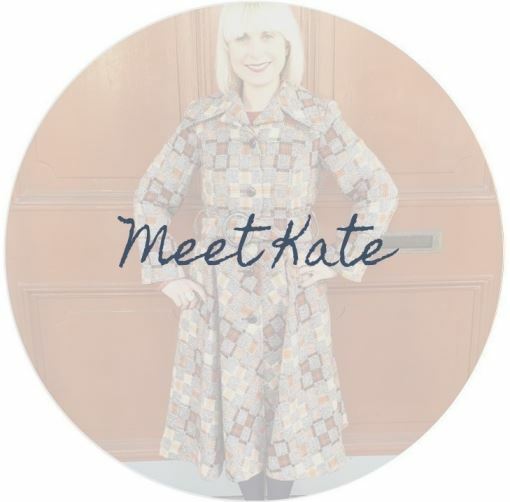 Keep your eyes peeled when out and about especially for vintage fabric at vintage fairs, markets, auctions and festivals. 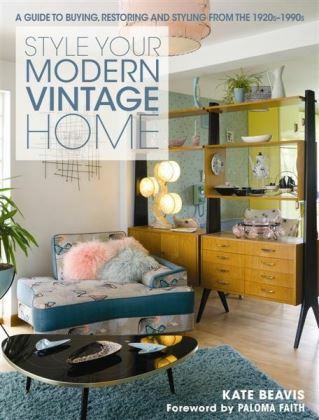 Personal favourites are The Festival of Vintage, The Vintage Home Show and 20th Century Design auctions which are held locally to me. 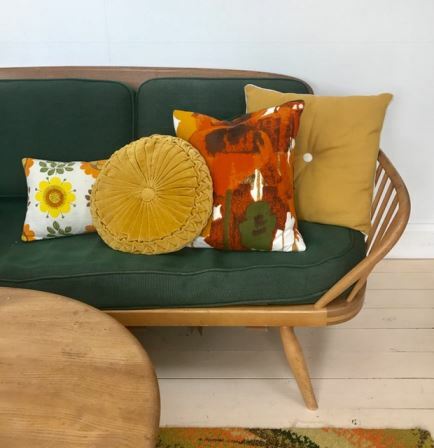 For any of you that don’t want to make your own homewares, preferring to buy vintage fabric from someone who has already done the searching and crafting for you, visit Pineapple Retro online who has made many of the products in this article. Alternatively, you could contact a local seamstress or upholsterer if you have already found the perfect textile to discuss your ideas.